Khama Billiat was on target on Saturday, helping his side seal an 8th league title in a match against Ajax Cape Town. The 27-year-old forward scored the first goal for his side in the 11th minute to equalise after Ajax had grabbed an early lead. He was fouled inside the box on the midway point of the half to give Sundowns a penalty which was successfully converted. However, he received a yellow card in the second period. 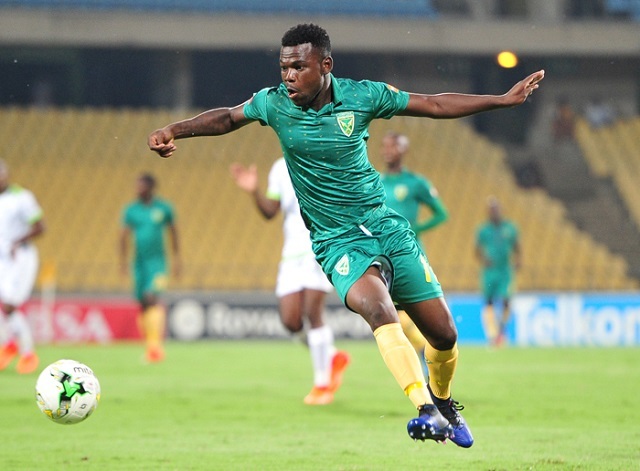 Also on the scoresheet over the weekend was Knox Mutizwa who hit a brace as his Golden Arrows beat Platinum Stars 3-2. He sent his side in front in the 18th minute before he scored the third goal in the 79th minute. Team-mates Danny Phiri and Kudakwashe Mahachi played in the encounter, but both received yellow cards. Onismor Bhasera and Evans Rusike started for SuperSport United in a 1-1 draw against Chippa United. Kingstone Nkhatha was introduced in the 27th minute as a replacement for injured Thabo Mnyamane. Nkhatha caused all sorts of problem, creating several chances but failed to convert any of them. Goalkeeper George Chigova was not part of the Polokwane City squad that played Free State Stars as he is still nursing his injury. Dominic Chungwa was also out of the team, but Walter Musona featured in the tie, coming on as a sub in the second half. Baroka’s Talent Chawapiwa played the whole ninety minutes against Ronald Pfumbidzai’s Bloemfontein Celtic. Pfumbidzai, however, did not play. Kaizer Chiefs midfielder Edmore Chirambadare finally got some game time after six months failing to break into the first team. Fellow country-man Willard Katsande also featured in the win against Maritzburg United.